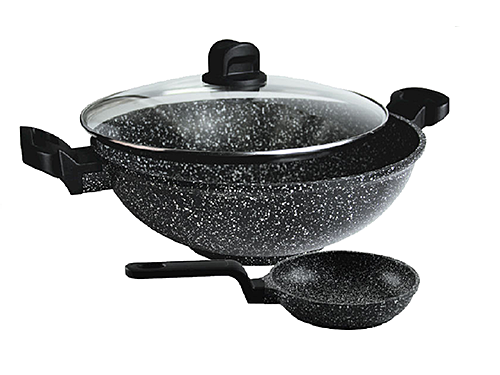 Set consists of 1 pc 32 cm wok and 1 pc 14cm egg pan. Die-cast interior for great conductivity and easy cleaning. Suitable for nylon, wooden and silicone utensils only. Ergonomic phenolic handle design for comfortable cooking. Spiral bottom for better conductivity and even heating. Marble wok comes with glass cover. Suitable for gas stove, electric, ceramic cooker and dishwasher safe.